Rolled out in September 2015, InstaCasino has become an ultimate destination for many online casino fans all over the globe. 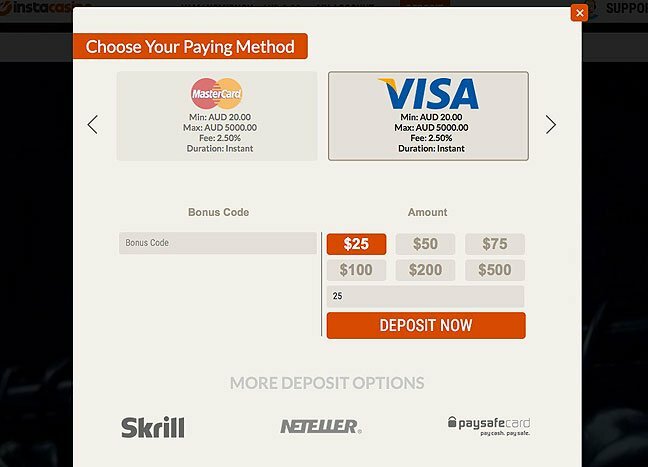 Along with delivering a host of modern and classic pokies, InstaCasino offers a stunning bonus package for newcomers and existing customers as well. There you will see a wide range of games and fresh promotions making your overall gaming experience much better and hassle-free. The casino has emerged onto the gambling industry quite recently, yet it has made it to become an award winner in some respectable award programs including the 2015 Best New Casino award (Pokiespedia) or the Beste NYE Casino prize bestowed by a German high-profile casino operator in 2016. All the games on offer are available in a demo mode without having to sign up or install a downloadable version on your computer. The website graphics designed in a predominantly white and orange color palette are slick and simple, so they do not put a heavy load on your Internet connection – all the pages and pokie titles are accessible in seconds flat. With its focus on globally renowned developers, the casino offers over 300 pokies and table games released by Netent, BetSoft, Microgaming and other high-profile software vendors. The suite of games you can find in the listings is being added to on an ongoing basis. 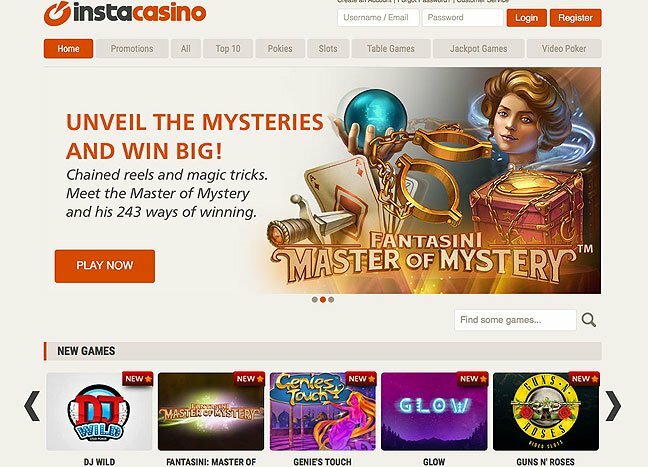 To serve users’ needs and preferences, InstaCasino handpicks the pokies considered to be one of the best and most popular in the industry. The games collection incorporates classic three-reel pokies, revolutionary 3D modern pokies with five reels, multiline and 243 ways to win pokies, and an array of other incredible titles to suit everyone’s tastes and budgets. What’s more, there are over three dozen progressive pokies that allow you to become an instant millionaire in one lucky spin. These include a fantastic Mega Moolah or a fabulous The Dark Knight Rises; both linked to a Microgaming’s jackpot system. You can filter pokies to display based on vendors, and search for pokies by title. Looking for an online table game? Well, InstaCasino is a right place to pick from a variety of roulettes, blackjacks and pokers; all available in a real-money mode and for free. What can be better than the thrill of looking at the ball spinning round a roulette wheel in real-time? Online games with live dealers will give you a real-life gaming experience from the comfort of your home. InstaCasino offers high table limits, a smooth video stream quality and a big selection of live games such as blackjack, roulette variations, baccarat, and others. Newcomers can enjoy a Welcome Package comprising three deposit bonuses with a x35 or x40 wagering requirement. These promotions are valid if you make a minimum deposit of $20. In addition, a newly registered user will get up to 20 RealSpins – these are free spins actually that are credited to your account enabling you to make a specific number of spins in whatever pokie at no cost to you. The promotions are updated over time, so come visit the casino website on a regular basis for new bonuses. The payment options available in the casino include credit and debit cards, E-Wallet payments, instant banking, prepaid cards and bank transfers. The funds are withdrawn with the same payment methods and currencies used to deposit money into a player’s account.